Just a few stitches more..
Back home - and spoiled.. But, we drove down to Oslo again yesterday- Left the cool, clean whiteness of Trysil behind - to.. a wet, green, snowless Oslo.. Just look at the tree in the picture above. Before we left (on December 23rd) there was atleast a little snow around the yard, but now? Nothing. Absolutely nothing..
Luckily, I can sit and admire the gorgeous gifts I received in this year's SSCS! (Thank you, hhttp://chookyblue.blogspot.com, for arranging this again!) 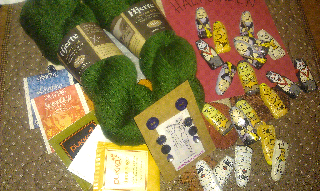 This year I was so lucky, I got to send two parcels to two (to me) new bloggers out there. I love the planning and preparations of the SSCS - I think it's even more fun than receiving a parcel (although, that's really exciting and fun too, don't get me wrong). My mom and I both placed our parcels under the Christmas tree, and opened them together with the rest of the family on Christmas Eve (after dinner and dessert). Look at the gorgeous organiser Narelle made me! 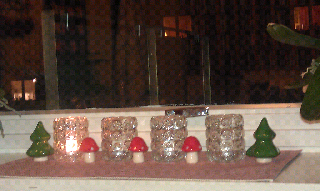 It fits perfectly over the side of the couch or the armchair, and included amongst other things, gorgeous embrodery floss and a measuring tape in the shape of a frog. Also in the parcel was a 2012 calendar featuring Australian wildlife and a lovely piece of fabric with both Australian scenery and animals. Thank you so much, Narelle! 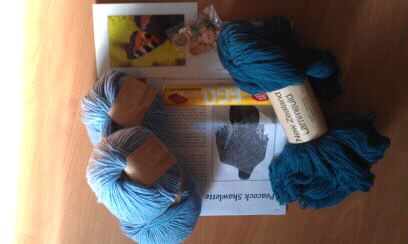 The second SSCS parcel I received was from Fiona. She sent me a gorgeous bag, with so many pockets inside I instantly thought that this has to become my quilt guild meeting bag! I think I can fit most anything possibly needed for a meeting the quilt guild in this bag (it's bigger on the inside, I think we might say - one of mye favourite quotes from a brilliant TV-series, btw). And do you see the little guy with the red ears standing in the back there with his nose in the air? Yes! This cute guy sat in one of the pockets of the bag! I don't have the heart to use him as a pincushion, but he seems to like the Santa next to him, so perhaps he can become his companion? Thank you so much, Fiona! I took a picture in the mirror so that you can see the size of the bag. I love the colours! Just before we left for Trysil, a third parcel arrived from Australia. 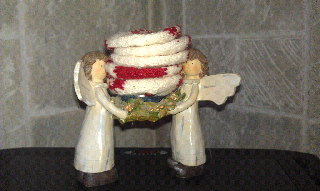 This one took me completely by surprice - it was from Donna! Inside, Donna had included a 2012 calendar with pictures of Australian scenery, some of her own postcards and a notepad (yes, those are her pictures on the cards and the notepad - she is a wonderful photographer!). Thank you so much, Donna! Christmas just wouldn't be the same without the Secret Santa Christmas Swap. This has been my fifth year participating - and I absolutely love it! Dear Mister (or Miss) Caterpilar, who seemingly lived in our tiny tree.. 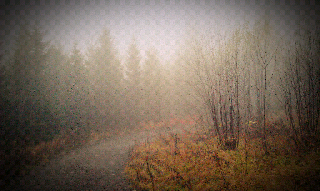 I am very sorry for flushing you, but 1) this is Norway, in December - e.g. not a very happy place to be for a caterpilar - and 2) we're going away for most of Christmas, so there wouldn't be any one to look after you (or much for you to eat, unless you know how to open the fridge and make yourself a sandwich or something..). Once again, I am very sorry for flushing you down the toilet - I hope where you end up will be some place better. Hey, look on the bright side, atleast you weren't eaten! Tonight I thought I'd post a couple of my favourite Norwegian (or Scandinavian) Christmas songs. Some you might have heard before - and some might be new for you. It'd be fun if you'd leave a comment if one of the songs/melodies are used for a different song in your country. First off is a song called Det Lyser i Stille Grender (meaning something like "light shining in silent places"). This is one of my absolute favorites at Christmas times! And then comes Julekveldsvisa (the Christmas Eve song). It's written by a writer/songwriter who's very known for his tales and songs for children (you might've heard about Mrs Pepperpot?). Let's see.. hmm.. Deilig er Jorden (earth is good?) is also a very pretty song. I'll leave you with another one of my English favourites, one that I (embarrasingly enough) forgot all about when posting my other favourite English Christmas songs. Who's not heard Jiminy Cricket sing When You Wish Upon a Star? It's just not Christmas without it.. The third weekend of advent is upon us, and tonight I'd like to share some of my favourite Christmas-y movies. These are (basically) the ones I watch (atleast..) once every year before Christmas. It's a tradition BF and I have, and that I think we'd like to transfer to Plutt (when he's older). The first movie is one we usually watch some time between Halloween/end of October and Christmas - it's the brilliant masterwork of Tim Burton, The Nightmare Before Christmas. A wonderful stop-motion animated musical. The second one is one of my all-time favourites (you might remember the title and the song from last week's list of Christmas songs?). If you haven't already seen it, the classic from 1952, then I urge you to do so. White Christmas is just as charming as it would've been back in the days (and the music is spectacular!). Bing Crosby and Danny Kaye, do I really need to say more? The next one is one of my mom's favourites (well, movies, anyway). I know, I know, Die Hard might not fit the Christmas movie category precisely - but, it's set on Christmas Eve.. that still counts, doesn't it? The Snowman is another animated Christmas movie that's just incredible well made - and definetly worth seeing, if you should stumble over it. And finally, it's Shrek the Halls - where Shrek and Fiona are back for a short Christmas adventure. It's entertaining and it's got a few memorable quotes. I really like the Shrek-saga. Gotta love the extended use of references to other movies, music, the cast, etc. Currently, they are both hanging in our tiny IKEA Christmas tree-bush (about 30 cm/12 inces tall) but some day I'd like to have a "real" (as in bigger) tree again (just, not right now, with young mister Iwannaclimbthat running around the living room, if you know what I mean..). It's the beginning of the second weekend of Advent, and I've been thinking about Christmas music for some time now. So I decided to take a quick youtube-search and see if I couldn't find some of my favourite Christmas songs (in English today, perhaps I'll find some in Swedish and Norwegian some other time). Do you remember this one? I was very young when the whole Band Aid first came around, but I remember that this song - and video - was played alot on the TV and on the radio when I was little, and although it's a sad song with an important message, it's just not Christmas without it (apparently, I'm not the only one who thinks so, seeing as it always seem to be on the new Christmas albums coming out every year). Sticking to the 80's you just cannot get around Wham! 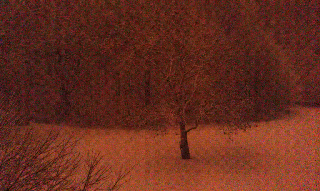 Well, this is another one of those songs you just cannot seem to get away from - but it's sweet, and the video is nice (LOTS of snow!). I think every one I know knows the lyrics for this one. I - to put it simply - absolutely love this song! (Did you ever watch the movie P.S. I love you? If not, watch it! The most hilarious memorial service - with the most unlikely, yet so loved by so many, Christmas-y song ever! And, last but not least.. What's a list of Christmas songs without Bing Crosby? I've got two favourites.. I couldn't chose one over the other, so I'm just going to list them both. Another movie you just have to see - if you haven't already seen it.. This man had the most wonderful voice..
And, finally, this one. Two unlikely partners in a duet that's simply out-of-this-world. So, there you have it. These are some of my favourite Christmas songs (in English). What's your favourite Christmas song? Or do you, as I have, have too many to chose from? Hva synes dere om gresskar-lykten jeg lagde i går? 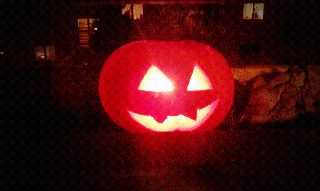 How do you like my pumpkin lantern? Jeg fikk masse superdeilig luktende te (mmm.. lakris..), to hesper Hifa Hjertegarn (for meg, ukjent, men i en herlig mørkegrønn fage), artige lilla knapper (prøvesmakt - og godkjente - av Plutt), og en hel flokk med halloweenutkledde sjokoladefolk (som lever litt i fare.. de var veldig gode!). 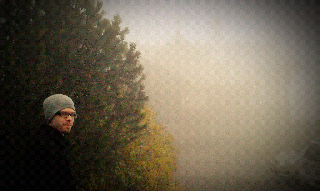 After a nice cup of hot chocolate, sitting by the fire, we walked in the fog and fallen leaves down to Holmenkollen. After breakfast, we took a stroll downtown, and took the T-bane up to Frognerseteren. 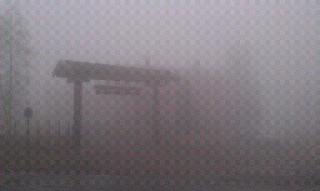 Look at the fog! It was like entering a scary movie - hearing noises around you, but unable to see more than a few meters ahead..
Breakfast at The Nighthawk Diner. 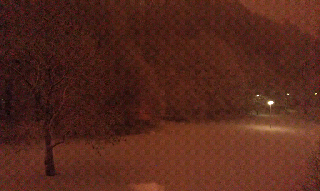 Jeg ville bare vise deg at vi er superhappyüberfornøyde med smokkesnoren jeg kjøpte til Plutt (selv om han ser alt annet enn fornøyd ut på bildet her.. men han er bare litt trøtt)! Håper å få muligheten til å hilse på deg igjen ved en annen anledning! If one should group together the different genres I think that sci-fi/fantasy would definetly win - but there's also quite a bit of children's movies and (as of the past couple of years) some dramas too. So, over the past few weeks - every now and then - we've taken a few titles off the shelf, looked at the cover, read the back - and either put it back up, or simply removed it. Leaving it first in a pile, and then moved the pile into a box marked TSP - auction. (I'm having doubts if there will be any TSP auctions in the not so distant future anymore, but I'm keeping faith that things will work out.) Yesterday we had a look at some of the series we've bought, seen. started watching, forgotten, gotten over, just never gotten the hang of, etc. And now there seems to be a little room to breathe again. Well, the shelves are not quite threatening to collaps is more like it.. I might even be able to move my complete Buffy-collection into it's rightful place again. During clean-up processes like this, you might stumble upon some long lost treasures - or things you perhaps watched a bit too much of in one go (it can happen.. trust me). 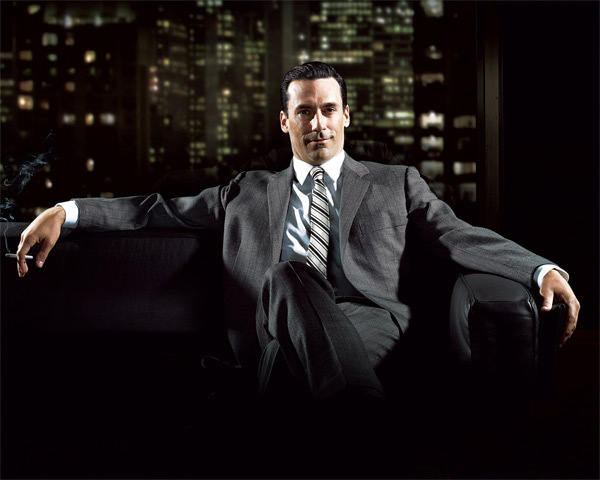 Mad Men was a series we watched quite a bit a while back. I think we went through season 1 and 2 pretty quickly, and then came to season 3 - and got a bit bored.. I still can't remember if we're watching season 3 or 4, but after watching an episode yesterday I've got a renewed feeling about this series. Perhaps it's good to take breaks every once in a while? What didn't change were my feelings towards Mr. Draper (one of the main characters). He's still the selfish, notoriously unfaithful, slimy, dirtbag as ever - but he's brilliant at it. He's just a guy you love to (partly) dislike. So, after yesterday's clean-up, Mr. Draper is back in - Ms. Mars is out (I think..), Bonekickers is (definetly) out, and so are a few of the other nowwhytheheckdidIbuythis-titles popping up here and there. Oh, and for our three BR's? Well, Avatar (of course), Alice in Wonderland (the Tim Burton edition) and Beauty and the Beast (Disney, my all-time favorite). They're all double-disc editions, with both standard DVD and BR included. It's nice to have a few minutes to spare in the morning. 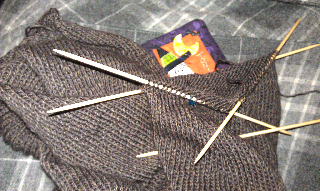 Today (and yesterday) I've done a little knitting in the kitchen before getting ready for work. 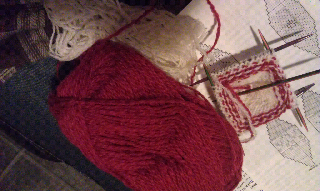 Red and white knitting, with tiiiiiny needles. 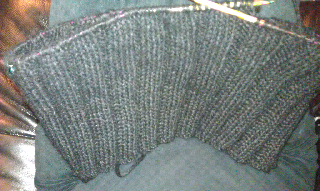 What I'm knitting on? Well, that's a.. ahem, no, really, that's a secret. ;-) You know, it's that time of the year again (Secrect Santa Christmas Swap, and such) so I really cannot tell you just yet.. Only.. well, OK then, I'll tell you one more thing.. Sorry for teasing, but this truly is the time for teasing - and teasers, secrets, planning, conspiracies, cold winds, beautiful sunsets and sunrises, fog, moonlight, candles burning and comfy blankets. Tonight we're (hopefully) finishing the last of the painting, so I expect there will be little to no crafty time for me tonight - but tomorrow morning I might be able to squeeze in a few stitches (being that knitting or sewing). Oh, and if you're wondering why my pictures are a bit strange lately, it's because I've been using my phone instead of my camera lately. It seems to be easier to snap a picture or two when the inspiration comes, instead of remembering to bring or take out the big camera.. Or would you rather that I blogged less frequently - and with better quality pictures? The view outside work yesterday morning.. It looked so nice, with the fog surrounding the building's skeleton, the sun peering through the support beams. Don't you just love her incredible voice? Adele was only 19 when the first video came - Chasing Pavements - and last year her second album came out, featuring (amongst other wonderful songs) Rolling in the Deep. Definetly two of my favorite songs! Up at the crack of dawn.. When Plutt awoke around 04:45 this morning, looking for his "motte", I decided to just get up and start my day. The alternative would've been to go back to bed and dozing off for about half an hour until my alarm rang, and I'd get up, drowsy and feeling waaaay too tired to to much except continuing to (more or less) nod off in the bathroom, in the kitchen, manage to get myself into the living room, continuing to doze off until Plutt (I expect) finally wakes up just before 6AM (again..). Picture borrowed from the Internet. Instead, I'm sitting in the living room, knitting on a Christmas present, glancing through the window at the complete and utter darkness out there. Nothing like the picture above, no, that would look more like the sunset a couple of days ago. But this morning, there's nothing but darkness out there. I might go through a couple of extra cups of coffee today.. and perhaps make another attempt at going to bed early (haha..). Yep, there's a tiny shoe hanging from the sleeve of my jacket..
Yea, I know! It's quite shocking, but I have been getting some sewing done this summer (and these are just a couple of the finished items). I haven't decided if this is a keeper or a gift item yet, if I end up keeping it, I might have to make another one (same size, atleast)﻿ since we have two of these huge pillows on our couch.. I really love the way it turned out, though. The stitcheries are adorable, and I think the rhaspberry coloured thread goes well with the colour of the fabric around (which was part of the prize I won from Jordbærstedet once, a few years ago). Nice to make something from stash, and nice to cross something off the (seemingly) endless list of things to do/finish. Now the two previously mentioned pillows are dressed in our own-designed, own-made pillow cases﻿ - and they fit right in with the rest of the (well, somewhat) wonky items in our living room (let's see, there's the Dalek-tin, my TARDIS piggy bank, a couple of Willow Tree-figurines, a viking head candle holder, and too many other things..). Funny thing, when Plutt sees the pillow cases, he points to them and says "Moo!". Not quite sure where the cow comes in, seeing as there are skulls on them.. Atleast he's learned to say "Bomme!" when he sees the back side (as in blomst/flower). 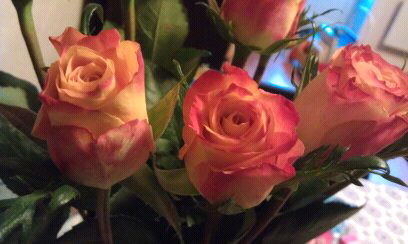 There are days when words just aren't able to say what you'd want them to say. Today has been a memorial day here in Norway. A day of thought, a day of memories - a day of candles burning in rememberance. In lack of words, I chose to share one of my all-time favorite songs (actually two) - Somewhere (Over the Rainbow) / What a Wonderful World. Light a candle. Hug a loved one. 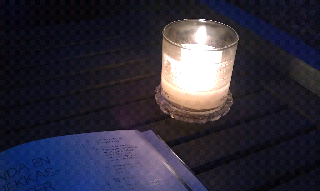 Knitting on the veranda, with a candle burning in the summer night. Very very cozy indeed. 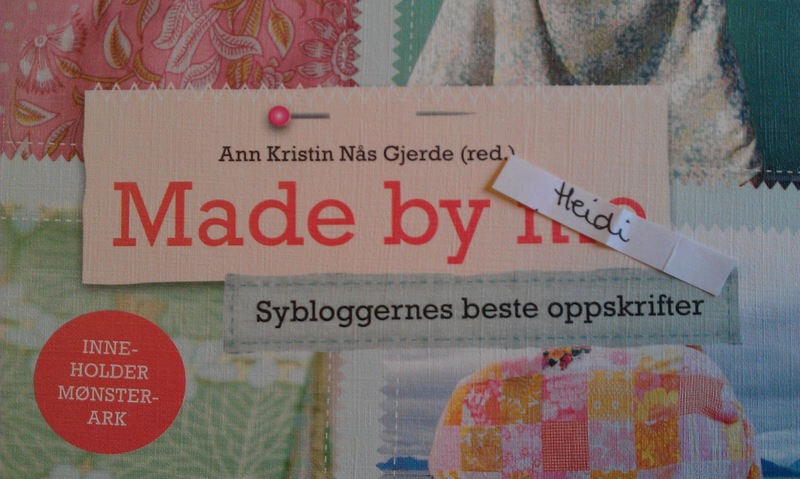 En gang rundt påsketider så jeg at det skulle komme ut en ny, norsk sybok (Made by me) - hvor en del av bidragsyterne var blogger jeg fulgte med på. Needless to say, jeg ble kjempeinteressert! En av disse, Vibeke, hadde en give-away på bloggen sin og på facebook, og jeg la igjen kommentar hos henne. Tingenes iboende, og så videre, førte jo selvfølgelig til at jeg kjøpte boken omtrent dagen før jeg fikk mail fra Vibeke om at jeg hadde vunnet en kopi av boken av henne - og dermed endte jeg opp med to. :) Så hva gjør man? Jo, man har en egen liten gi bort-runde! Har du lyst til å vinne et eksemplar av denne fullkomment herlige boken, trenger du bare å legge igjen en kommentar under dette innlegget (det eneste jeg krever, er at jeg skal kunne nå deg via epost). Vinneren trekker jeg fredag 15. juli. :) Fin feiring av (i allefall min) siste jobbedag før ferie, ikke sant? Føler meg ganske så bortskjemt nå, jah.. Tusen takk, Blomstermamma! 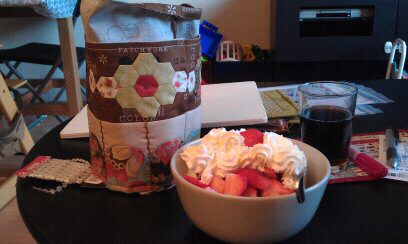 Strawberries, whipped creme, pepsi max, CSI and handsewing.. does it get much better? I felt it was time to make a few changes on my blog - so I've changed the colours to a more purple shade, and think I'm going to leave it like this for a while. See how (and if) I like it. 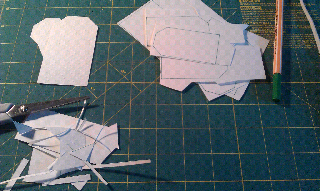 I was in a great sewing mode the other day - too bad Janie (my Janome) wasn't.. Turns out she might've caught a bug or two - so she's on desk rest (haha) until my mom comes down in a week or so, and if she's unable to help me fix her, she's going to have to go to the sewing machine doctor..
One for the gift basket! There's not only been knitting going on lately, there have been some attempts at exercising my sewingmachine (although I think - or, more, feel - that the last months of mainly knitting have made me a bit out of practice when it comes to sewing, so I'm not 100% satisfied with absolutely everything I've made these past few weeks..). Two bakecloths (or bakeklede, as we say in Norwegian) - one in brown and one in purple (they are identical, except from the colours - that's why the brown one is folded). The brown one has been tested (works perfectly!) and will remain in our kitchen, but the purple one will go in the gift basket (or the shelf for things that will be given away on suitable occasions, as it is also known as). Fun pattern - and stashbusting! It's been about two years since my mom and I went to Göteborg, Sweden for the Nordic Quilting Association (or something like that, Nordisk Quiltetreff), where we both bought a folder to keep our sewing equipment from the danish shop Quilt My Design (my mom bought the pattern for a larger folder, while I bought the kit for the small one). Well, I started the appliqué this winter, and then put it away - thinking that it would take forever to finish it.. *haha* I ended up skipping some parts of the original pattern, and ended up spending about 2-2.5 hours finishing it last week (minus the binding, but that was done in a jiffy later that evening). Here's Timmy showing off the result again - and look! I've even sewn on one of my name tags (not bad, if I may say so - that usually takes a while). Now, remember, I chose to skip a few steps in the original pattern, and it's the first time I've tried to sew elastic bands on to something like this (and I am not entirely happy with my handsewing on this one) - but, you know what? I'm happy! It's cute, it's done, it's crossed off my list! (And I'm keeping this one all to myself!) Almost two years to the day - but it's done. I think I'm going to finish this post just by repeating that.